Arcanum junior Camille Pohl gets a dig against New Lebanon Dixie on Tuesday night in a first-round match at the Division III sectional tournament at Brookville. 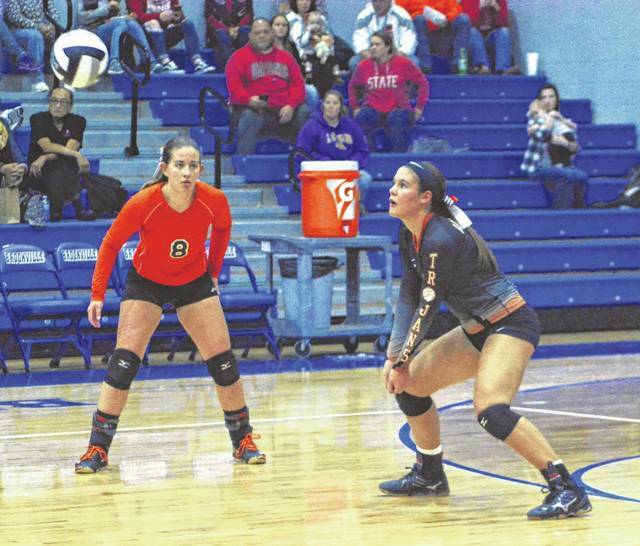 The fifth-seeded Trojans swept the Greyhounds in three sets to advance in the tournament. Arcanum junior Gracie Garno gets a dig against New Lebanon Dixie on Tuesday night in a first-round match at the Division III sectional tournament at Brookville. The fifth-seeded Trojans swept the Greyhounds in three sets to advance in the tournament. 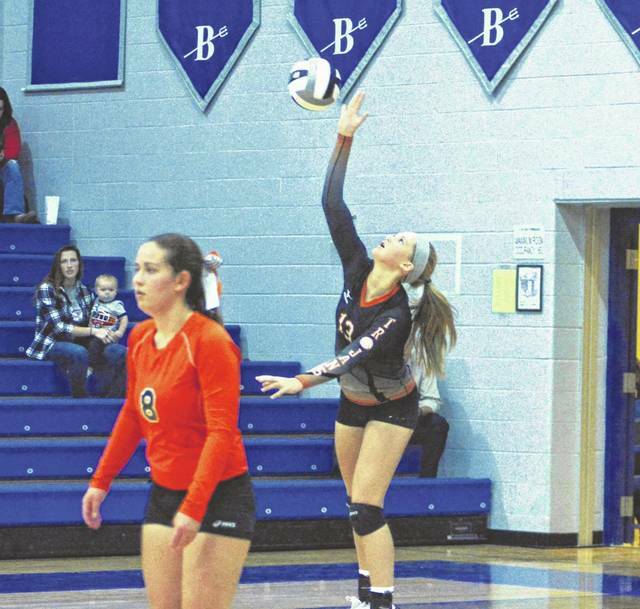 Arcanum freshman Taylor Gray serves against New Lebanon Dixie on Tuesday night in a first-round match at the Division III sectional tournament at Brookville. The fifth-seeded Trojans swept the Greyhounds in three sets to advance in the tournament. 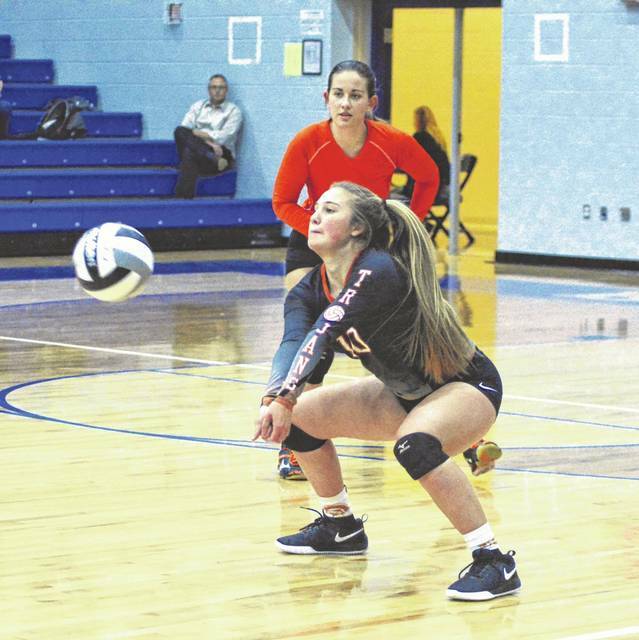 BROOKVILLE – The fifth-seeded Arcanum Trojans volleyball squad was taking care of business in every which way with a straight set victory over 11th seed Dixie Tuesday night at Brookville to open up sectional play. The scores were a routine rout of 25-16, 25-17 and 25-10. The Greyhounds were dogged by an onslaught of kills by a trio of Trojans at the net in which the ‘Hounds had no answer. This win was their 20th of the season setting a school record, and it catapults them into a matchup all fans have been clamoring to see as they now face Jamestown Greeneview’s Lady Rams, who are 21-2 overall, at 11:30 a.m. on Saturday. The first game definitely was not lame as Arcanum’s potent servers and terrific net play proved to be the difference. The Trojans ripped off 10 of the first 11 points after it was a 2-1 count with eight straight. Dixie got as close as eight at 20-12, before the Trojans got five of the last nine points by arching their shots over the ‘Hounds who were already grasping for air. The second game was more of the same in the end much to the chagrin of the hustling Greyhounds of New Lebanon. They actually took a 1-0 lead and were nip and tuck at 10-9 down before the talented Trojans took control. Dixie got as close as 14-13 before the Darke County squad dug down deep and ripped off 11 of the last 15 points for a 25-17 count. The third game was a tussle for the first 10 points as the Trojans only had a slim margin at 6-4 before Arcanum started putting their shots together. Arcanum made like avid fisherman and reeled in point after point to go on an 9-0 bust out with a series of digs and kills much to the fans delight. Dixie got as close as 15-8 before another Trojan onslaught of 10 of the last 12 points pointed the ‘Hounds bus in the direction of Johnsville- Brookville Road to prepare for next season as they bowed out at 9-14.